I recently stayed for four nights at this four star Copenhagen hotel. Having booked a standard room directly with the hotel, I was offered an up-grade, on arrival, to a more superior and larger room. I find this to be a common occurrence when you book directly on-line with the hotel in question, as oppose to using a third party, such as Expedia or Booking.com. Although initially, there might be a slightly higher room cost, the 'regular' upgrade makes it worthwhile. 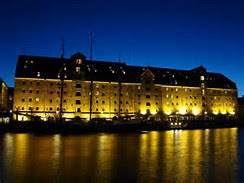 Situated in a central location, close to the water, opposite the opera house and within a five minute walk of Nyhavn (below) and a ten minute walk to a metro station that takes you directly to Copenhagen airport, the Admiral Hotel is in a superb situation for sightseeing, business or for just relaxing. The bar and their 'Salt' restaurant are on the ground floor and close to reception from where lifts take you to the guest rooms. Converted from a former dockside warehouse, the Admiral Hotel retains most of its historical features, both in the public areas and in the bedrooms. Large scale timbers supporting the vast building structure are everywhere and have been tastefully incorporated into a modern style Danish hotel. 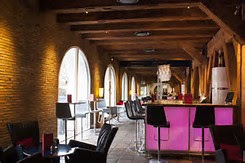 The bar (below) is quite small and being in the reception area, it lacks the warmth that one finds in many top hotels. Nevertheless, it serves its purpose, if you can find a seat, and the staff are friendly and accommodating, though the bar prices reflect the high standard of living in Denmark, with a standard glass of house wine being approximately £9. 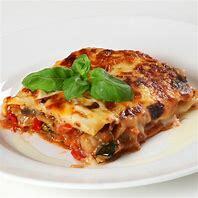 Bar food is served from a limited menu that duplicates the choice and cost found on the room menu, but without the service charge. Although, my partner and myself only had one meal at the bar, my wife had to send her plate of mussels back to the kitchen as they were not cooked. A replaced 'cooked' dish was quickly provided alongside a fresh portion of fries. Sadly we did not eat in the hotel's Salt restaurant, choosing to eat breakfast and dinner at one of the many cafes and eateries that surround the hotel, and are all in close walking distance. The hotel breakfast was about £17 per head extra, while a coffee and a croissant in a local breakfast cafe was £5 per head. The hotel's restaurant seems popular with locals and tourists alike and looks out over the water and across to the splendid opera house on the opposite bank. Our room (below) was on the third floor, with a window overlooking the street, as oppose to the harbour on the other side of the hotel. It might have been worthwhile requesting a 'water-view', but I was happy with the up-graded room and there was little traffic or pedestrian noise, although it was February and with snow falling there were few folk about. 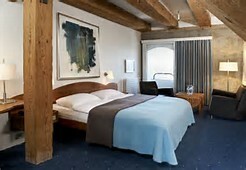 The room had a well equipped mini bar, large King size bed, sofa, easy chair and writing table. Nicely lit with WiFi connections, the room was cosy and atmospheric and one was temped to stay in the warmth rather than venture out on a cold evening. Sadly, as often is the case in hotels, there was a lack of wardrobe and storage space for winter clothing. Why don't hotels provide more clothes hangers? The bathroom, as many visitors to the Admiral Hotel say, was a little 'tired' but more than adequate - clean and generous in size, with a bath and a shower over the bath (now very dated!) and fresh towels, which were exchanged when requested. Extraction from a steamy bathroom was a problem and my partner resorted to using her own hairdryer rather than the one provided in the bathroom. Work is currently underway to provide air conditioning to the hotel and its rooms, something that summer visitors have complained about. And I can imagine the rooms and narrow corridors being very hot and stuffy at the height of the July and August season. 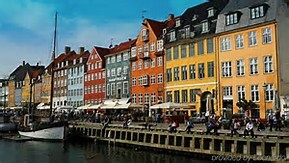 However, I would recommend the Admiral Hotel to anyone planning a trip to the beautiful but expensive city of Copenhagen. I paid a room rate of £180 per night at current UK exchange rates. Sugar Puffs Now Just Puffs! ECO COFFEE PODS ARE HERE!